Why are the world's older trees disappearing? And they make pretty nifty places to build treehouses too! But now scientists say these ancient giants are under threat. According to a report published recently in the journal Science, death rates have increased alarmingly among trees between 100 and 300 years old. Swedish forestry records dating back to the 1860s were the first hint that researchers found of the scale of the problem. A 30-year study of Mountain Ash in Australia showed that big trees were dying at 10 times the normal rate in years when there wasn't a big fire. The problem, they say, is global. The causes varied. "We're seeing mass mortality in many systems," said Prof David Lindenmayer from the Australian National University. From California's Yosemite National Park, to the African savannahs, to the Brazilian rainforest, the older bigger trees are being lost regardless of climate and environment. "They're being cooked by higher temperatures or being burnt in fires. 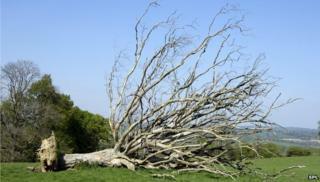 We don't always see the differential, that the older, bigger trees are more prone," said Prof Lindenmayer. Across an agricultural landscape like Australia, there are many bigger older trees visible. But, according to Prof Lindenmayer, the positive appearance is deceiving. "Not one of these trees has been able to reproduce successfully, because of grazing," he said referring to the damage done to saplings by hungry cattle and sheep. "We have 5-10 years left where they are still producing seeds, we need to control the grazing process - we need to work with land owners." As well as logging and farming, humans are also introducing new species that are proving deadly to big trees. "We are changing the world in so many ways at once," says another of the authors, Professor Bill Laurance of James Cook University. "We are moving organisms and disease and pathogens - all over the planet weeds and other exotic species are proliferating like crazy!" Anyone who has been keeping track of the ash dieback story in recent months would probably agree. In many cases it is the combination of factors that is proving toxic for trees. In the western part of the US, pine bark beetles have thrived, partly because of changing temperatures. "The populations are building up because they would normally be killed off by winter," said Prof Laurance, "but the winters are becoming so much milder they are proliferating and in some cases are wiping out entire forests." But while the presence of humans has been a major factor in increasing deforestation and the clearing of land for farming, the absence of humans can also be a threat to trees. A report about the Peruvian Amazon says that farmers are leaving rural areas for jobs in the cities. The authors argue that this actually increases the threat of fires damaging trees. "When you have more fallow land," said lead author Maria Uriarte, "and fewer people around to work at control, that combination generates those big fires." When it comes to trees, we just can't seem to do right for doing wrong.